I think there are some design choices specific to the execution of these Rogue labels that I wouldn’t have made. But I appreciate their simplicity, and variations on a theme that allows them to be distinct but hang together as a brand. Let’s assume for a moment that Revue isn’t a mostly ugly, clumsy typeface that is conceptually inappropriate to this bottle of beer. How are we supposed to understand that this flavor belongs to the Troegs brand? It turns out most of their labels veer away from the brewery’s brand, putting way too much burden on the neck label to tie them all together, and ultimately, this sort of tactic engenders flavor loyalty, not brand loyalty. Also, Nugget Nectar is an unfortunate name. Right? 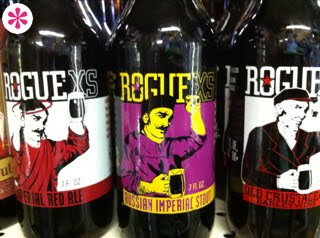 Cheers to P*S* Reader and iPhone user Kristina Franklin for contributing the Rogue image. I really like the Pr*tty one. My first thought went to Andy Warhol. A really clever way to make sure people recognize the brand and the colors make sure they can see the difference in product.